Trigger Warning: We will be discussing scary thoughts and birth trauma below. Before we get pregnant, we rarely think about the way we want to give birth. It’s not something that crosses our minds until we’re staring down at a plus sign on a little white stick. Even then, we’re usually in a state of shock and awe for quite a while. It isn’t until the excitement of being pregnant dies down that we start to consider what our birth experiences will be like and make a plan. When you got to the place where you were ready to plan your birth, you likely did all the research you could. Staying up late at night practicing Lamaze while watching all the birthing videos on YouTube. As your due date got closer, you began to imagine what giving birth would feel like and made plans that aligned with your values and your desires. You took into account your pain tolerance, your medication preferences, and what you wanted to experience with your newborn after delivery, and you had a goal to make your birth the most positive experience possible. But, when the time came, your birth was nothing like how you imagined it would be or what you planned for. In fact, it was downright traumatic. Perhaps you’d been envisioning a natural birth. You’d invested in a Hypno program and practiced your visualizations and affirmations daily. You also made it clear to your OB that you wanted to do immediate skin-to-skin and get the baby to your breast naturally. You’d decided to delay your baby’s bath and only wanted to have your partner in the room for the first hour. Ever since you came home from the hospital you can’t shake the feeling that something terrible is going to happen. You feel on edge constantly, and you can’t stop thinking about extreme scenarios. You’ve lost your belief in yourself and your ability to make situations in your life go the way you want them to. These thoughts occupy your mind every moment of every day, it seems. And the hardest part is that they scare you and you don’t know how to stop them. Your usual ways of coping aren’t working. So, every day you cry, continue to fixate on what went wrong, and search for answers. Unfortunately, when you enter as big of a transition as motherhood riddled with insecurity and instability, you may find yourself anxious and nervous all the time. Your mind may be preoccupied with your birth and what went wrong, and you may even feel so protective over your baby that it’s hard for you to relinquish even a small amount of control to your partner. Not only does living your life burdened by this intense anxiety affect your own sense of safety and security, but you begin to fear for the safety of your baby as well. Eventually, you wind up in a place where you feel completely alone and like you’re “going crazy”. But the truth is that birth trauma, and the feelings that are associated with it, are incredibly real. Your thoughts are upsetting and scary, but other women also struggle to come to terms with a disappointing birth experience. It’s ok to reach out for help and to voice your worries so that you can alleviate these intense anxious feelings. It’s true that your traumatic birth robbed you from the first moments with your baby in the way you imagined. And this makes you question and worry about your ability to be the type of mother you want to be. However, if you can learn how to ground yourself, you can move beyond your intense anxiety and actually begin to feel more at ease with motherhood. Keep reading for four grounding techniques to help you gain control over your anxiety. It’s painful to admit you didn’t get the birth that you wanted. And you can’t help but think that if you’d only ate better, exercised more, or sat in a less comfortable position, things would have gone the way you hoped. As a result, you blame yourself for what went wrong and spiral down the rabbit hole of making sense of what happened. Every day your thoughts ruminate around your traumatic birth and all this does is leave you tremendously anxious about actually being a mother. Since you weren’t able to plan for and execute your birth the way you intended, it is hard for you to have confidence in the fact that you’ll know what to do when your baby is sick or not wanting to nurse. Even if you think you have a good idea about what your baby’s cries are telling you, you doubt you’ll be able to actually give him what he needs. New motherhood is hard enough, but beginning the journey with shaken confidence and an utter lack of belief in yourself turns an already difficult job into something that feels downright impossible. Although you struggle to believe in yourself and your ability to care for your baby right now, you have the potential to make your anxiety go away. To lay the anxious thoughts and feelings to rest and move on. Once you begin to accept your birth experience, you can start to move beyond the way it has robbed you of your power. As you own what happened and recognize how strong you were to get through your birth, you can start to rebuild your confidence as both a woman and a mother. Reflecting on the outcome and making peace with the details in counseling will help you feel calmer about the situation and you will also have a different, more balanced perspective on the birth. When you choose to live more in the present rather than constantly replaying your birth, you will be able to feel closer to those around you as you will no longer be isolating yourself or consumed by anxiety. Through the healing process, you will also feel more bonded to your baby than you have been able to before. Whenever you feel a loss of power your natural desire is to find ways to have control again, so you can feel better. But trying to regain control by seeking answers constantly, only fuels your anxiety and keeps you stuck in a vicious loop. But it doesn’t have to stay this way. You don’t have to continue to suffer from anxiety in silence. The key to freeing yourself from worry is to examine the thoughts and beliefs that are keeping you stuck and actively work towards changing them. Here at Postpartum Health & Harmony, we specialize in helping moms with a wide variety of their postpartum needs, including using grounding techniques to ease their anxiety. Below is an example of our favorite grounding techniques that will help you be more present for yourself and your new baby. Step #1: Sit or lie down. In order to feel grounded, it helps to connect to the earth. Feeling the solid surface underneath allows you to feel more connected to the space you are in and your thoughts are less likely to wander toward negative things. At PHH we guide our clients through grounding themselves by practicing in session. Baby in your arms or not, we’ll walk you through how to first get comfortable, tune into your body, and take notice of the space beneath you. At home, you can try this by pulling out a comfy cushion to sit on or even lying down on your living room rug. The pace at which your thoughts enter your mind will directly match how quickly you are breathing. Concentrate on taking slow, deep breaths and you’ll notice that the scary or painful things that pop into your head become more manageable. When you come to PHH, we teach you to quiet your mind by first focusing on your breathing. This is a great way to be present and start to pay less attention to your thoughts. The key is not to have a totally clear mind, but to be able to bring your focus back to your breath when an anxious thought comes. If this is hard to do on your own at home, try combining counting with your breath. Inhale for a count of 4 and exhale for a count of 7. Step #3: Notice how your body is feeling. As you sit still and focus on your breathing, you may start to recognize parts of your body that feel uncomfortable. It may feel like tension or a dull ache, but you might also feel sharp pains or tightness. Tune in to what these sensations are telling you as they might be able to give you a clue about your anxiety. As you do so, imagine sending healing energy to that part of your body. Picture the energy washing away any tension or pain, like a wave that has crashed on the shore and recedes, bringing the discomfort away from your body. Continue to do this until you’ve addressed all the areas of tension. Now that you’re feeling relaxed and comfortable, you can begin to work directly with your anxiety. An effective way to do this is to incorporate all of your senses. Start by naming 5 things you can see, then 4 things you can touch. Follow that up with 3 things you can hear, 2 things you can smell, and finally name 1 thing you can taste. At PHH, we take the time to walk through this exercise together so that it feels natural to practice it on your own. Clients find that this exercise focuses their mind on each task, and gives them a break from thinking about their distressing thoughts. As a result, you feel calmer and more present. Bonus step: Your anxiety can often keep you from feeling a connection or being able to bond with your baby. When you work through these four steps to calm your anxiety, try holding your baby and talking them through each step as you do it. Let them know that mommy is practicing deep breathing and that you’re focusing on what your senses are picking up in your environment. Your baby will pick up on your calm energy and see this as an enjoyable way to spend time with you. Birth trauma is very real and leaves you reeling with intrusive thoughts and anxiety. It sets the tone for a motherhood experience that is disconnected from reality and from those you love and trust. But the lack of control you are feeling is normal. More importantly, it can be resolved so you can feel happy and at peace again in your life and with your new baby. 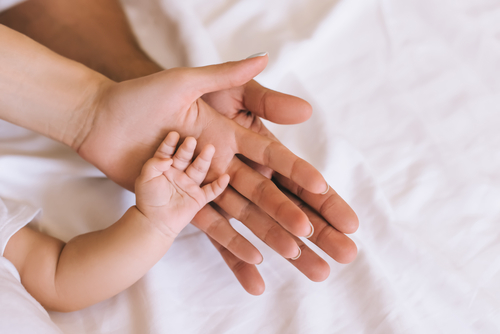 To talk about your traumatic birth with someone who really gets it, schedule a session with Postpartum Health and Harmony today and take the first step towards healing.